You are hereby duly and cordially invited to the coronation of Arkadius Frederik Gustavus des Vinandy, Aartshertog van 's Koningenwaarde, Hertog van Gasconje, Hertog van Levensburg, Graaf van Bourbon, Graaf van Dasburgh, Graaf van Girond, Graaf van Vinandy, Baron van Ammerswoude en op de Loet, Baron van Bergkirche, Baron van Heydelberg, Heer van Audinghen, Heer van Paravel is bevestigd, op wijze van nobele afstamming van Zijne Majesteit Arkadius Hendrik des Vinandy, Koning van Batavië, Hertog van Gasconje, Graaf van Vinandy as king of Batavia. 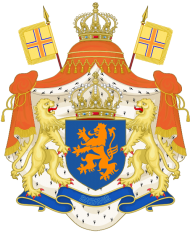 The coronation will be held on the 9th Sprokkelmaand (February, 9). The coronation takes place in the Cathedral of ‘s Koningenwaarde, during the united meeting of the House of Commons and the House of Lords, with His oath-taking of the royal promise of office. In celebration of the coronation of our new king you are invited to for a royal concert on Arkadiusplein in ‘s Koningenwaarde.